This Duncan Imperial is a reproduction of the vintage plastic Duncan Imperial with chevron logo first introduced in 1954. It is mounted on a reproduction card bearing the 75th Anniversary logo used by Duncan. 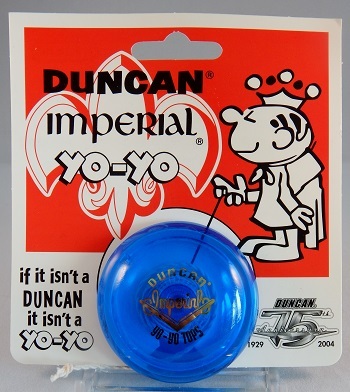 Compare the artwork of Duncan's Mr. Yo-Yo on this card with the artwork used on an early 1960s version of the Imperial.